Posada Larsens is a small, warm and comfortable place where you can relax and have greats holydays. 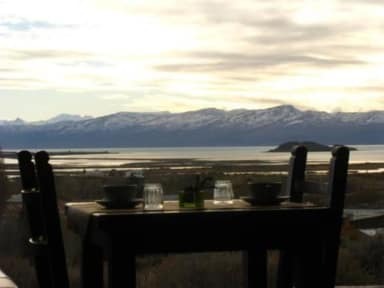 Is 5 minutes driving from the big Lake Argentino and from the mountain chain “Andes” which you can admire from the window of any of our rooms. We are located in El Calafate. It is a small town where you can do many activities: 4 x 4 on the mountain, you can enjoy several museums, horseback riding. If you like the mountain bike you can ride all around the lake. There are excellent restaurants where you can try the typical Patagonian lamb. Every room in our Posada Larsen has both mountain and lake view, free Wi-Fi, small table and chair. 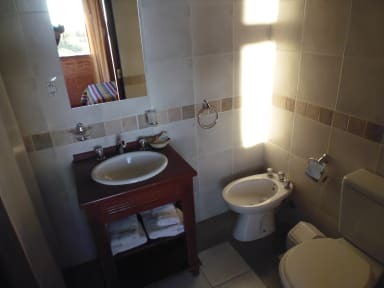 Each room has a private bathroom and all of them have many facilities such as mirrors and hairdryer. Awesome stay. Felt like home. Super friendly and helpful staff. Perfect location with a beautiful view, good breakfast and helpful staff. Juan is great! Very nice place to stay with a panoramic view. The breakfast is delicious, especially the homemade yoghurt and the scrambled eggs. Very kind host that helped us a lot, for example when our flight was canceled. Highly recommended!